The very mention of the word, ‘Kerala’, brings to me, visuals of coffee and spice plantations, the breathtakingly beautiful backwaters and palm-lined trees. Now, I mention the next best thing and that is food, of course! Having gorged on deliciousness from this state since childhood, it holds a special place in my heart. (Read on about what we wrote in an earlier post). 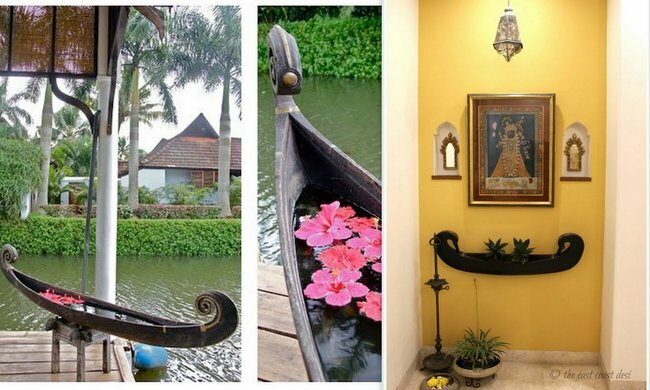 However, apart from the cuisine, a Kerala-inspired home, always leaves me speechless. So, a bit more about it. What is Kerala known for? 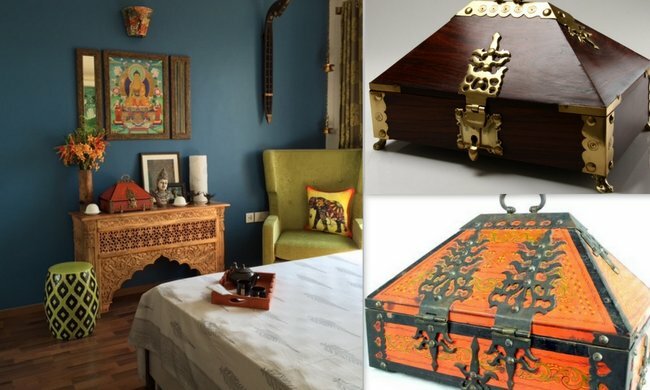 The Nettur Petti, or the Kerala jewellery box is a stunning artefact made of rosewood and embellished with intricate brass features reminiscent of temple architecture. It has seen a revival of sorts in recent times, all thanks to the efforts of craftsman VV Suresh Kumar. His products can be found on Travankore, the Bengaluru based online store, for all things that bring Kerala to your home. You can buy one for your home from Aranmulamirror.com or from Travankore online. A Prabhavali is basically the arch surrounding an icon of the Creator. You will typically find them surrounding deities in temples. Find beautiful pieces at The Indian Weave, an online store, founded in collaboration with India’s finest artisans. Connect with Chandan Dubey, a Mumbai based artist creating beautiful pieces, and have a peep at her Prabhavali collection. 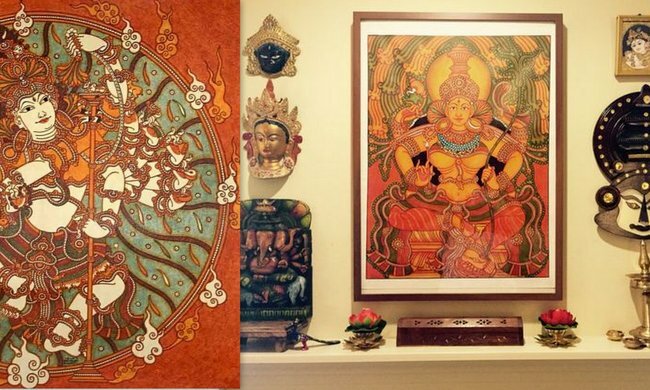 Prabhavalis framed on silk to add grace to your home. They have been beautifullly created by PhotoPlus by Chandan Dubey Images via 1, 2; Sold by: The Indianweave. 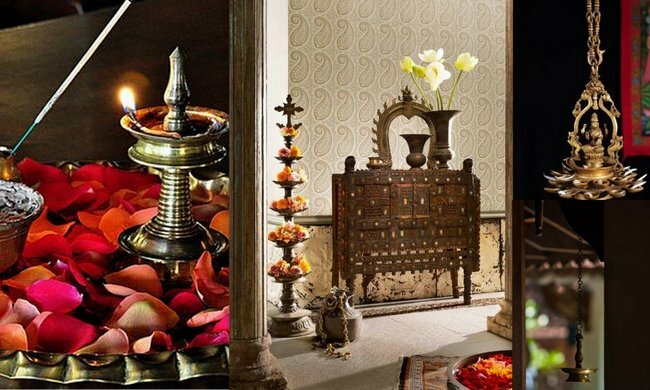 The Nilavilakku and the Kuthuvilakku are the traditional oil lamps of Kerala. 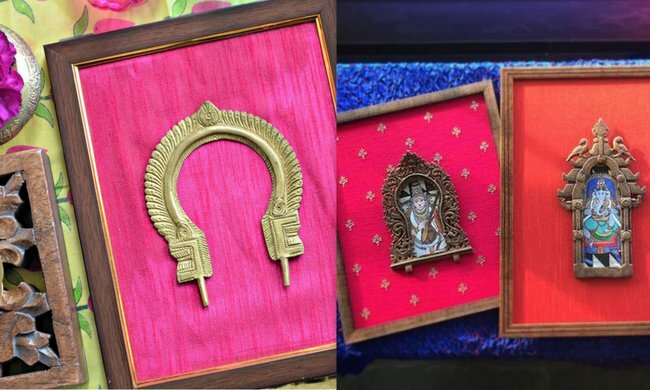 In addition to their religious significance, they help in adding a traditional touch to your home decor. The Chundam Vallam or the snake boat is a traditional boat used in the Vallamkali or boat games during Onam. Get a miniature piece and use it on the dining table with tea lights or fix it on the wall and place some plants on it. Let your imagination take wings! The Kerala mural paintings need no introduction. They were the fresco paintings depicting mythology and legends, painted on walls of temples and churches. Get one in your home, or have it painted on canvas. Contact online: Prince Thonnakkal of Midhila murals. Click here to contact Naveen Bhaskaran from Kerala Murals. 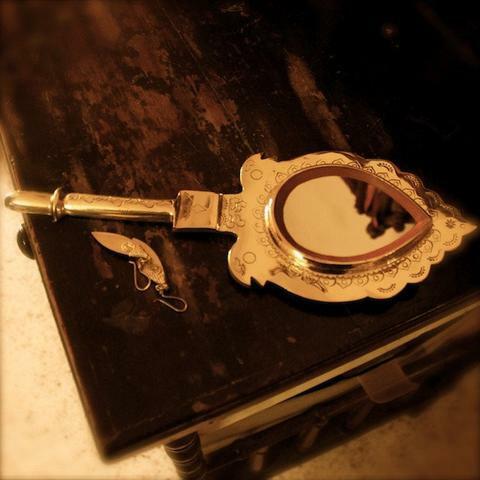 Did you know that the Aranmula Kannadi finds a mention in the ancient Indian texts, ‘The Puranas’, where it is described as the mirror of Goddess Parvathi? There is so much more trivia that I could add, but I will save that for the next time. It is absolutely fascinating to learn about cultures, folklore and traditions. Maybe, bring them into your home as conversation starters! Sometimes, shopping (or even window shopping or browsing) takes you to places you’ve never known and things you have never seen before. Doesn’t it? So, learn something new everyday! Be Notjustashopper. Thank you for writing to us. We have been unable to get his personal contact details. The only details we have are of the store he sells through. However, we are still trying and will update you if we get something.